WHO IS SHE? This talented singer-songwriter with a most beautiful voice was raised along the New Jersey shoreline. Growing up, when her friends were collecting the latest New Kids on the Block album, she was raving about Traffic or Cream. At the age of 13 she found an old beat up guitar in the attic of her house. It had belonged to an uncle who died when he was young, and she taught herself to play a Grateful Dead song. Her father turned her on to blues artists like Jimmy Reed, and allowed Nicole to sit in on sessions with local musician friends. 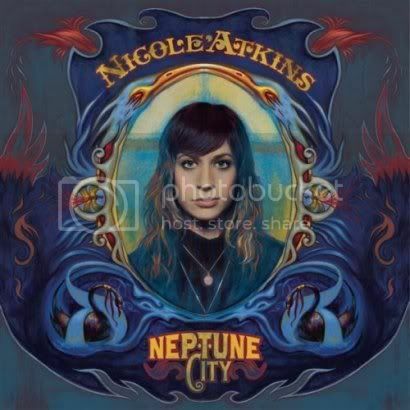 NEPTUNE CITY: A little more than a year ago, Atkins released her beautiful debut, "Neptune City," to critical acclaim by Rolling Stone, Entertainment Weekly, Spin Magazine, the New York Times, among others. Neptune City was produced by Tore Johansson (Cardigans, Franz Ferdinand, OK Go, Saint Etienne, New Order), an album that sounds like it came from anywhere but the New Jersey Americana rock tradition made famous by Bruce Springsteen. TOUR & CRITICAL ACCLAIM: Over the last year, Atkins has toured extensively to support Neptune City's release and has headlined North American and European Tours as well as performances on the Late Show with David Letterman, Late Night with Conan O'Brien, the Late Late show with Craig Ferguson, and most recently a performance on Later with Jools Holland in the UK with Metallica, Carla Bruni, and Kings of Leon. Atkins is currently on break with new shows (see the links below) planned beginning the end of September. I love this sound so much! Great track! Under the Milky Way came out first--a year before Lovesong.